34052 Trinidad y Hermanos, Ranchuelo, Cuba. Cigarrete Card No 584. 1- 3/4" x 2'1/2" Aprox. Early 1900' Some flaws and small damages. 34051 Trinidad y Hermanos, Ranchuelo, Cuba. Cigarrete Card No 556. 1- 3/4" x 2'1/2" Aprox. Early 1900' Some flaws and small damages. 34049 Trinidad y Hermanos, Ranchuelo, Cuba. 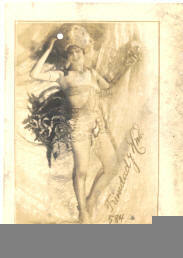 Cigarrete Card No 611. 1-3/4" x 2'1/2" Aprox. Early 1900' Some flaws and small damages. 34048 Trinidad y Hermanos, Ranchuelo, Cuba. Cigarrete Card No 557. 1-3/4" x 2'1/2" Aprox. Early 1900' Some flaws and small damages. 34047 Trinidad y Hermanos, Ranchuelo, Cuba. Cigarrete Card No 670. 1-3/4" x 2'1/2" Aprox. Early 1900' Some flaws and small damages. 34046 Trinidad y Hermanos, Ranchuelo, Cuba. Cigarrete Card No 581. L. Francis, Tiple. 1-3/4" x 2'1/2" Aprox. Early 1900' Some flaws and small damages. 34045 Trinidad y Hermanos, Ranchuelo, Cuba. Cigarrete Card No 49. 1-3/4" x 2'1/2" Aprox. Early 1900' Some flaws and small damages. 34044 Trinidad y Hermanos, Ranchuelo, Cuba. Cigarrete Card No 44. 1-3/4" x 2'1/2" Aprox. Early 1900' Some flaws and small damages. 34043 Trinidad y Hermanos, Ranchuelo, Cuba. Cigarrete Card No 50. 1-3/4" x 2'1/2" Aprox. Early 1900' Some flaws and small damages. 34041 Trinidad y Hermanos, Ranchuelo, Cuba. Cigarrete Card No 586. Luz Gil. 1-3/4" x 2'1/2" Aprox. Early 1900' Some flaws and small damages. 34040 Trinidad y Hermanos, Ranchuelo, Cuba. Cigarrete Card No 69. 1-3/4" x 2'1/2" Aprox. Early 1900' Some flaws and small damages. 34039 Trinidad y Hermanos, Ranchuelo, Cuba. Cigarrete Card No 370. 1-3/4" x 2'1/2" Aprox. Early 1900' Some flaws and small damages. 34038 Trinidad y Hermanos, Ranchuelo, Cuba. Cigarrete Card No 504. Bataclan Mexicano. 1-3/4" x 2'1/2" Aprox. Early 1900' Some flaws and small damages. 34037 Trinidad y Hermanos, Ranchuelo, Cuba. Cigarrete Card No 620. Lupe Rivas Cacho. 1-3/4" x 2'1/2" Aprox. Early 1900' Some flaws and small damages. 34036 Trinidad y Hermanos, Ranchuelo, Cuba. Cigarrete Card No 585. 1-3/4" x 2'1/2" Aprox. Early 1900' Some flaws and small damages. 34035 Trinidad y Hermanos, Ranchuelo, Cuba. Cigarrete Card No 45. 1-3/4" x 2'1/2" Aprox. Early 1900' Some flaws and small damages. 34034 Trinidad y Hermanos, Ranchuelo, Cuba. Cigarrete Card No 490. Lidia Francis. 1-3/4" x 2'1/2" Aprox. Early 1900' Some flaws and small damages. 34033 Trinidad y Hermanos, Ranchuelo, Cuba. Cigarrete Card No 615. Margot. Teatro Alhambra. 1-3/4" x 2'1/2" Aprox. Early 1900' Some flaws and small damages. 34032 Trinidad y Hermanos, Ranchuelo, Cuba. Cigarrete Card No 703. Schally, Fdie Bergere. 1-3/4" x 2'1/2" Aprox. Early 1900' Some flaws and small damages. 34031 Trinidad y Hermanos, Ranchuelo, Cuba. Cigarrete Card No 499. Elia Granados. 1-3/4" x 2'1/2" Aprox. Early 1900' Some flaws and small damages. 34030 Trinidad y Hermanos, Ranchuelo, Cuba. Cigarrete Card No 84. 1-3/4" x 2'1/2" Aprox. Early 1900' Some flaws and small damages. 34029 Trinidad y Hermanos, Ranchuelo, Cuba. Cigarrete Card No 596. 1-3/4" x 2'1/2" Aprox. Early 1900' Some flaws and small damages. 34028 Trinidad y Hermanos, Ranchuelo, Cuba. Cigarrete Card No 478. Maria Corio. 1-3/4" x 2'1/2" Aprox. Early 1900' Some flaws and small damages. 34027 Trinidad y Hermanos, Ranchuelo, Cuba. Cigarrete Card No 583. 1-3/4" x 2'1/2" Aprox. Early 1900' Some flaws and small damages. 34026 Trinidad y Hermanos, Ranchuelo, Cuba. Cigarrete Card No 52. 1-3/4" x 2'1/2" Aprox. Early 1900' Some flaws and small damages. 34025 Trinidad y Hermanos, Ranchuelo, Cuba. Cigarrete Card No 644. 1-3/4" x 2'1/2" Aprox. Early 1900' Some flaws and small damages. 34024 Trinidad y Hermanos, Ranchuelo, Cuba. Cigarrete Card No 575. 1-3/4" x 2'1/2" Aprox. Early 1900' Some flaws and small damages. 34023 Trinidad y Hermanos, Ranchuelo, Cuba. Cigarrete Card No 706. 1-3/4" x 2'1/2" Aprox. Early 1900' Some flaws and small damages. 34022 Trinidad y Hermanos, Ranchuelo, Cuba. Cigarrete Card No 583. 1-3/4" x 2'1/2" Aprox. Early 1900' Some flaws and small damages. 34021 Trinidad y Hermanos, Ranchuelo, Cuba. Cigarrete Card No 67. 1-3/4" x 2'1/2" Aprox. Early 1900' Some flaws and small damages. 34020 Trinidad y Hermanos, Ranchuelo, Cuba. Cigarrete Card No 106. 1-3/4" x 2'1/2" Aprox. Early 1900' Some flaws and small damages. 34019 Trinidad y Hermanos, Ranchuelo, Cuba. Cigarrete Card No 39. 1-3/4" x 2'1/2" Aprox. Early 1900' Some flaws and small damages. 34018 Trinidad y Hermanos, Ranchuelo, Cuba. Cigarrete Card No 118. 1-3/4" x 2'1/2" Aprox. Early 1900' Some flaws and small damages. 34017 Trinidad y Hermanos, Ranchuelo, Cuba. Cigarrete Card No 530. 1-3/4" x 2'1/2" Aprox. Early 1900' Some flaws and small damages. 34016 Trinidad y Hermanos, Ranchuelo, Cuba. Cigarrete Card No 506. Aurorita del Real. 1-3/4" x 2'1/2" Aprox. Early 1900' Some flaws and small damages. 34015 Trinidad y Hermanos, Ranchuelo, Cuba. Cigarrete Card No 474. Gergette de Lorza. 1-3/4" x 2'1/2" Aprox. Early 1900' Some flaws and small damages. 34014 Trinidad y Hermanos, Ranchuelo, Cuba. Cigarrete Card No 91. 1-3/4" x 2'1/2" Aprox. Early 1900' Some flaws and small damages. 34013 Trinidad y Hermanos, Ranchuelo, Cuba. Cigarrete Card No 588. 1-3/4" x 2'1/2" Aprox. Early 1900' Some flaws and small damages. 34012 Trinidad y Hermanos, Ranchuelo, Cuba. Cigarrete Card No 471. Marieta Fernandez. 1-3/4" x 2'1/2" Aprox. Early 1900' Some flaws and small damages. 34011 Trinidad y Hermanos, Ranchuelo, Cuba. Cigarrete Card No 451. Eva Stachino. 1-3/4" x 2'1/2" Aprox. Early 1900' Some flaws and small damages. 34010 Trinidad y Hermanos, Ranchuelo, Cuba. Cigarrete Card No 590. 1-3/4" x 2'1/2" Aprox.Early 1900' Some flaws and small damages. 34009 Trinidad y Hermanos, Ranchuelo, Cuba. Cigarrete Card No 607. Bataclan Mexicano. 1-3/4" x 2'1/2" Aprox. Early 1900' Some flaws and small damages. 34008 Trinidad y Hermanos, Ranchuelo, Cuba. Cigarrete Card No 103. 1-3/4" x 2'1/2" Aprox. Early 1900' Some flaws and small damages. 34007 Trinidad y Hermanos, Ranchuelo, Cuba. Cigarrete Card No 704. Pezet, Fdies Bergere. 1-3/4" x 2'1/2" Aprox. Early 1900' Some flaws and small damages. 34006 Trinidad y Hermanos, Ranchuelo, Cuba. Cigarrete Card No 489. Jessy Moreno. 1-3/4" x 2'1/2" Aprox. Early 1900' Some flaws and small damages. 34005 Trinidad y Hermanos, Ranchuelo, Cuba. Cigarrete Card No 469. Mawre Bataclat. 1-3/4" x 2'1/2" Aprox. Early 1900' Some flaws and small damages. 34004 Trinidad y Hermanos, Ranchuelo, Cuba. Cigarrete Card No 93. Early. 1-3/4" x 2'1/2" Aprox. 1900' Some flaws and small damages. 34003 Trinidad y Hermanos, Ranchuelo, Cuba. Cigarrete Card No 581. 1-3/4" x 2'1/2" Aprox. Early 1900' Some flaws and small damages. 34002 Trinidad y Hermanos, Ranchuelo, Cuba. Cigarrete Card No 462. Eva Stachino. 1-3/4" x 2'1/2" Aprox. Early 1900' Some flaws and small damages. 34001 Trinidad y Hermanos, Ranchuelo, Cuba. Cigarrete Card No 507. Rosita la Casa. 1-3/4" x 2'1/2" Aprox. Early 1900' Some flaws and small damages.